It was Christmas shortly after the end of World War II. One of Bedford’s Selectmen noticed the children of a poor family as they watched Santa going into one of the churches for a Christmas party. Though his children were excited, their father held them back as they were not members of the church. The Selectman, Clayton Morril, realized the children’s disappointment and resolved to do something about it. If you would like your family to participate in this program and receive a Christmas Eve visit from Santa, we ask you to respond by registering with the appropriate information that will be used to help plan Santa’s visits. 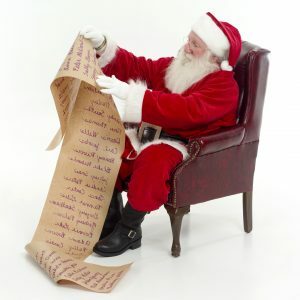 As you know, Santa has a very busy Christmas Eve schedule; our advance planning for his extra visits will make his evening move smoothly along. Mark your calendar! Gift Drop Day is Saturday, December 15th, 2018! Thank you to all who made Gift Drop Day happen!